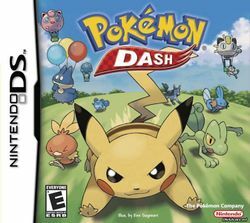 Pokémon Dash is the first Pokémon racing game, and is also the first Pokémon game for the Nintendo DS. In Japan, Europe and Australia, it was a launch title for the DS. It was developed by Ambrella the same group behind the game Hey You, Pikachu!. It is also the first racing game in the Pokémon games series. It stars the Pokémon Pikachu in the one-player mode along with other playable Pokémon in the two-players mode. Using a stylus, the player can control a Pokémon and races to each checkpoint. After the racer has passed each of the number of checkpoints in order, they finish the course. When the person boots up the game for the first time, he is automatically directed to a training cup. After completing the training cup, the player has the chance to play in the Grand Prix Mode (GP mode). There are five main cups to compete in GP mode, as well as harder GP modes that can be unlocked that put the player against a faster level of Pokémon, similar to the Mario Kart Series. Each cup has five courses within its area. Pokémon Dash has many Pokémon, stages, and courses of different terrains to choose from. The player can link up to a maximum of six Nintendo DS. If the player has Pokémon Ruby, Sapphire, FireRed, LeafGreen or Emerald in the Game Boy slot, and completed GP mode, it is possible to upload your team to Pokémon Dash to race in courses shaped like the Pokémon that have been uploaded. The courses will randomly generate the checkpoint for each Pokémon. When playing each level, your Pokémon's name, and level will be stated, with the time you have to complete all 6 courses being equal (in seconds) to the combined levels of the uploaded team (with bonus time for using multiple Pokémon of the same type). This page was last edited on 7 September 2015, at 05:45.